Temperature has an effect the efficiency and maximum pv output of a solar panel. The hotter a panel gets, the less power it generates. The ambient temperature, temperature coefficient of the actual panel and the type of installation are all factors that affect the yield potential of a solar power system. Every solar panel will have a temperature coefficient. The temperature coefficient represents the rate at which the panel will underperform at each increase in degree Celsius (°C). Most panels have a temperature coefficient of between -0.2% /°C to -0.5%/°C, when tested under standard laboratory conditions, where ambient temperature is set to 25°C. The closer the temperature coefficient is to zero, the better the panel will perform when the temperature rises. All solar panel manufacturers are required to provide the temperature coefficient figure. In many instances, a solar cell can get as hot as 65°C, causing the panel to become less efficient and therefore produce less power. If a panel with a temperature coefficient of -0.4%/°C were to reach an extreme heat of 65°C, it would reduce output by as much as 26% (-0.4% x 65). However, there are more variables involved than simply the coefficient value, and the equation is a little more complicated. The type of panel installation also has an effect on the temperature of panels. When solar panels are installed on a rooftop, they experience far greater temperatures than the current ambient temperature. Panels that are fixed parallel to the roof with little to no airflow between the rooftop and panel are the least efficient and experience the greatest rise in temperature (35°C). A typical rack-type installation will allow for a gap of greater than 150mm between the roof surface and the panel, allowing airflow to have a cooling effect on the panel. This type of installation is more efficient than an installation fixed parallel to the roof and typically leads to a 30°C rise in panel temperature. However, the best scenario is where the solar panel is pole-mounted in a free-standing frame (25°C). 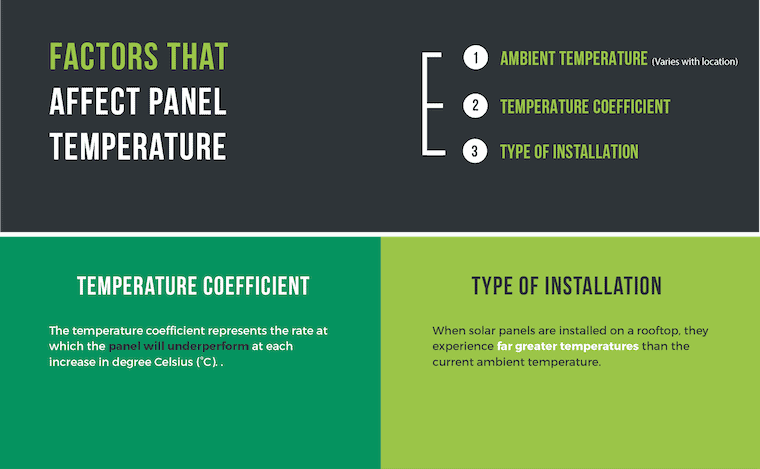 Each of these installation types has an effect on the temperature of the panel, and therefore the output of the panel. The Clean Energy Council of Australia has assigned temperature rises to each of these installation types, to be used a guide for calculating the temperature derating of a solar panel system. Once we know the temperature coefficient, the installation type and the ambient temperature of a location, then we can calculate the temperature derating of the solar panel. In the above scenario, if the ambient temperature is 28°C, the panel will lose 13.2% of its output. This is a large chunk of the power it generates. This is where it is worth comparing panels that have lower temperature coefficients, especially in warmer climates. If a panel with a coefficient of -0.2%°C was installed, then the temperature loss would only be 6.6%. When our tools calculate solar power for your address, we assume that the panels are fixed to the rooftop using a rack-type installation with a gap greater than 150mm. We also assume an average temperature coefficient of -0.4%/°C. We then factor in the average ambient temperature of the nearest weather station to your address and apply it to calculate a temperature derating specific to your location. This derating is then used in calculating an efficiency rating for your solar panels. In the case of our off grid calculator, the average daily temperature during the lowest yielding month is used when ‘winter hours’ option is selected.